Israeli Apartheid Week took place on more than 30 university campuses across the UK last week despite a massive government backed campaign of repression. 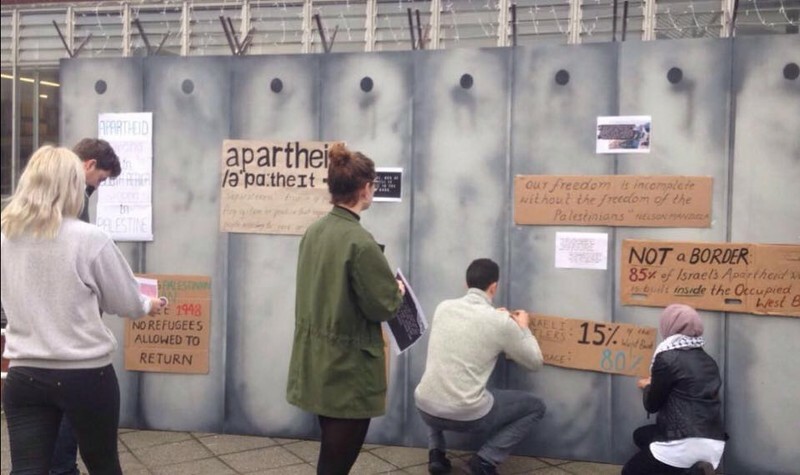 Students at the University of Cambridge and five other campuses erected mock apartheid walls during Israeli Apartheid Week. The week saw some events cancelled, with unprecedented and bizarre restrictions imposed on organizers. Israeli Apartheid Week is an annual series of events that last year took place in more than 225 cities across the world to raise awareness about how Israel meets the UN definition of apartheid and to build support for the boycott, divestment and sanctions (BDS) movement. Thousands of students and academics attended events as part of what was one of the biggest Israeli Apartheid Weeks in the UK to date. This was doubly impressive given the unprecedented campaign of repression launched against Israeli Apartheid Week by the UK government, universities and the pro-Israel lobby. The campaign came in the context of broader attacks on Palestine organizing in the UK and across the world. On 13 February, UK universities minister Jo Johnson wrote a letter, seen by The Electronic Intifada, titled “Tackling Anti-semitism on campus” to Nicola Dandridge, the head of Universities UK, the representative organization for universities. Johnson’s letter was passed on to the head of each of the UK’s universities. British university staff are also being told to “manage” pro-Palestine events on campus as part of the government’s controversial Prevent anti-extremism strategy, Middle East Eye reported. In addition, pro-Israel organizations lobbied universities directly, urging them to cancel Israeli Apartheid Week events and organized mass letter writing campaigns. According to an email newsletter it sent out, the Board of Deputies of British Jews, a pro-Israel organization, met with several universities to call for the cancellation of events. Apparently urged on by pro-Israel groups, the Charity Commission, the regulating body for UK charities, sent intimidating emails to student unions at many of the universities where Israeli Apartheid Week was taking place. Having spoken to different student organizers and student union officers, it is clear the commission asked unions a series of questions about Israeli Apartheid Week. This included insisting that unions reconsider the “suitability of invited speakers” and urging them to take extra measures to ensure that Israeli Apartheid Week events were lawful. Management at the University of Central Lancashire revoked permission for a speaker panel, forcing organizers to hold the event off campus. Management falsely claimed the event violated the government’s controversial new guidelines on anti-Semitism. At University College London, management forbade a planned street theatre event on the grounds that risk assessment forms had not been filled in on time. The director of the University of Sussex, Adam Tickell, emailed a statement to all students which said, “we will not tolerate intimidation of anyone for their religious or political opinions about the politics of the Middle East” and claimed that “the language” surrounding Israeli Apartheid Week was “deeply upsetting.” Students I talked to believed this was an attempt to intimidate them for their political opinions about the Middle East. Several universities sent official observers to events or organized their own recording of events for monitoring purposes. Yet despite all this, Israeli Apartheid Week events still took place at more than 30 campuses. 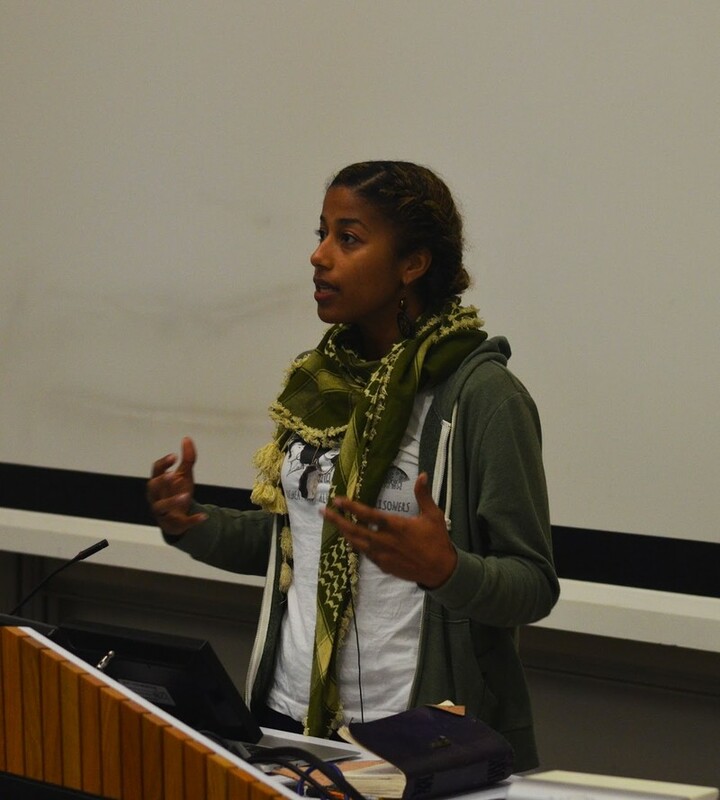 US spoken word artist and organizer Aja Monet and South African anti-apartheid veteran and academic Farid Esack spoke to hundreds of people at events at Kings College London, the University of Manchester and the University of Sussex. Monet also performed at a packed out cultural event in London alongside Palestinian spoken word artist and organizer Rafeef Ziadah and Moroccan band N3rdistan. 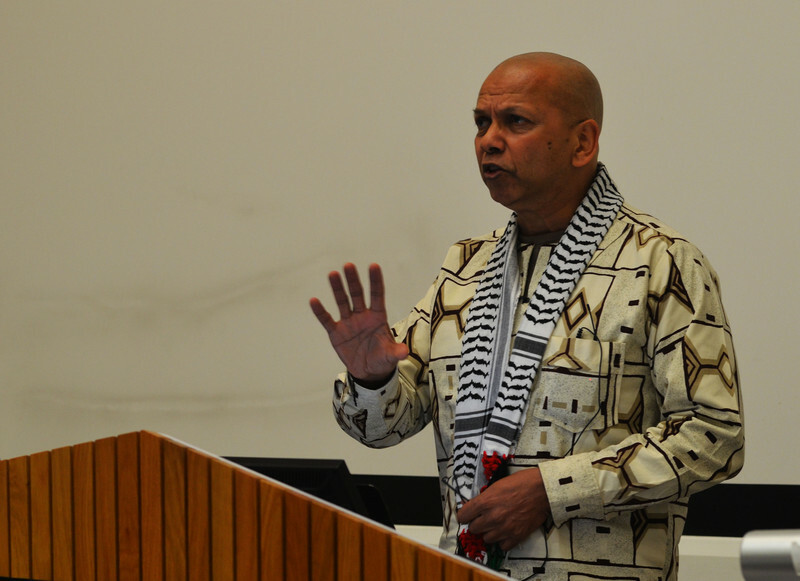 Abed Salayma from Hebron-based group Youth Against Settlements spoke out against Israeli apartheid at Portsmouth, University College London, Goldsmiths, Brunel and several Scottish universities. At the University of Oxford, talks were given by Palme d’Or winning director Ken Loach and Professor Avi Shlaim. The Israel lobby had clearly set its sights on the complete cancellation of Israeli Apartheid Week in the UK. Indeed, the Board of Deputies of British Jews sent out an email claiming credit for some of the cancellations of events and other repressive measures enacted by universities. The fact that inspiring, impressive and well attended events still took place across the country is down to the way in which students, as well as many student unions, stood up to university management and firmly pushed back against the repression. Explaining how Israel meets the UN definition of apartheid and that Palestinians are entitled to the same human rights as everyone else is part of a global anti-racist struggle – despite whatever the Israel lobby claims. It’s also significant that academics across the country wrote emails to management and brought up concerns about repression in their departmental meetings. More than 250 academics signed an open letter published in The Guardian denouncing the campaign of repression. It’s clear that attempts to repress Palestine solidarity organizing won’t stop students standing up for Palestinian rights. In a statement, the Israeli Apartheid Week UK organizing committee said that although the restrictions “created an atmosphere of fear and intimidation on university campuses” attempts to silence the Palestine solidarity movement would fail.